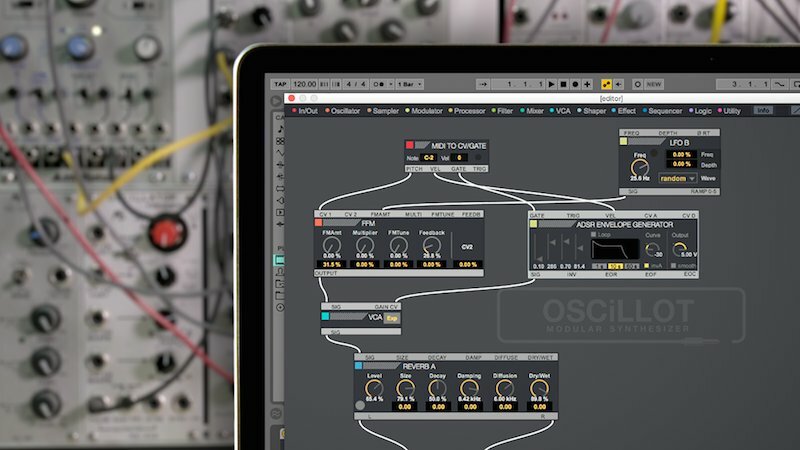 With over 100 freely patchable modules and dozens of pre-patched synths and effects, OSCiLLOT brings the near-infinite creative possibilities of modular synthesis to Ableton Live. 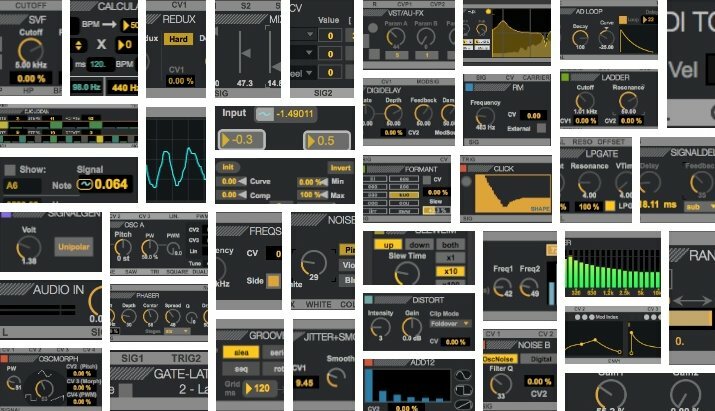 OSCiLLOT is a complete modular system for Ableton Live. The more than 100 modules – including oscillators, processors, filters, mixers, modulators, amplifiers, shapers, sequencers, utilities and more – comprise the basic building blocks of many electronic instruments and effects. The good thing about working with a modular system is that it requires no programming knowledge to make your own patches; simply connect any output of any module to an input of any other module with a patchcord and you’re on your way. And while each module has a fairly narrow range of functions, patching together even just a few modules can quickly give rise to complex sounds. For update information and changelogs please visit the OSCiLLOT forum. With OSCiLLOT, there is practically no limit to the type of instrument, sound or effect device you can make once you start connecting modules. To name just a few of the possibilities, you can patch together your own FM, additive, and subtractive synthesizers, resonators, filters, envelopes, convolution reverbs, mixers, frequency shifters, sequencers, drum machines, logic modules, compressors, and waveshapers. Working with a modular system is always an experiment to some degree, and happy accidents are part of what make modular synthesis fun. So with a little bit of trial and error you’ll be coming up with sounds you’ve never heard before. If you’re not familiar with some of the concepts or methods of modular synthesis, OSCiLLOT makes it easy to acquaint yourself with them. Start by loading one of OSCiLLOT’s instrument presets and hit the ‘Open Editor’ button. In the Editor window you’ll see all the modules used in this particular preset and the connections between them. Activating the ‘Info’ button and clicking on any of the modules will bring up a detailed description of that module’s function, features and the types of signals it can send and receive. While the CV/gate/trigger-based modular hardware systems are usually monophonic, OSCiLLOT features up to six voices of polyphony. OSCiLLOT lets you choose between straight or curved patchcords or even hide them completely when they are in the way (try that with hardware). In addition, you can zoom in and out in the Editor window, add annotations and labels, and of course, save your patches. As mentioned, no programming knowledge is needed to patch together the modules, but since OSCiLLOT is a Max for Live device, Max/MSP enthusiasts can make and modify their own modules – an SDK is available here. Of course, Max for Cats are also planning further modules, be sure to keep in touch with maxforcats.com for the latest developments. And if you already own a modular system or other CV/gate-enabled instruments, OSCiLLOT can interact with your hardware – provided you have a DC coupled audio interface. Modular synthesis has its roots in the experimental music departments and electroacoustic laboratories of the 1950s and 60s when composers and engineers first began interconnecting the oscillators, amplifiers, filters and other components they were using to realize their new electronic music compositions. Then, beginning in the mid-1960s, a few enterprising companies including Moog, Buchla and ARP began to make individual modules and entire systems available commercially. These systems were further refined through the 1970s but as analog gave way to digital in the 1980s, development in the field of modular synthesizers all but stopped completely. However, the last decade and a half has witnessed a strong resurgence of development and interest in modular synthesizer hardware. With the establishment of the relatively compact Eurorack format as a standard size for modules, a whole slew of small companies such as Doepfer, Analogue Systems, Make Noise, Intellijel and others began reproducing and expanding on classic module designs as well as building new and original modules that make use of previously unavailable technologies. This creative explosion on the part of the manufacturers went hand in hand with a re-discovery among electronic musicians of the possibilities of analog and modular synthesis. Now, users of Ableton Live can conveniently enter the world of modular synthesis with OSCiLLOT by Max for Cats.